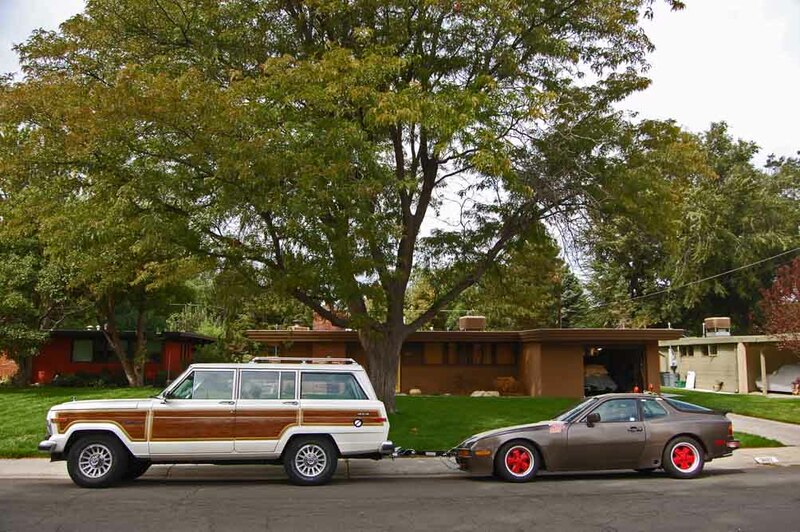 Try this on for size - you just buy a new-to-you racecar and take it to the track to run her. 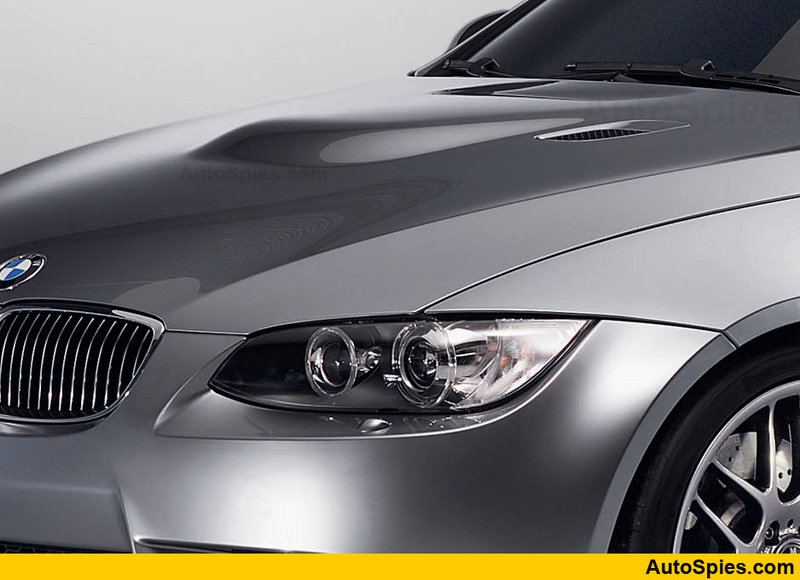 And, as you are letting the car idle and cool down after your last session you hear an unmistakable knocking sound. You feel your stomach get tight. Yep, you just spun a rod bearing. What a way to get into racing. So, in the spirit of our series where a lot of people helped me get on track I've been helping another racer get the blown motor out and swap in a new-ish one. Just with refreshed bearings and baffled oil pan. Somehow, working on others cars is so much more enjoyable. I guess it is that you can just drive away and not have to look at the broken heap. M3 Hood Bulge Vulgar Show of Virility? I kept the photos B&W to give them a perverse bit of Mapelthorpe arty-ness. I walked past a BMW M3 with the ridiculous hood bulge and it just struck me as gross. Vulgar. Showy. Like a male animal puffing and grunting to gain attention of a female partner. Really, was there no other solution? Give me a car without a bulge any day of the week. Every race car/team needs a motto. Something to rally around. And the Hunt for 901 Writer Racing 944 has a motto. And now that it is in vinyl, it is official. Really, if you don't finish last it is a successful weekend. So, "If you're not last, you're first!" is the motto. It is a little rejiggering of a Ricky Bobby quote. Listen to Ricky explain it to you here. He didn't trademark my version of it. This won out over "Press on Regardless" and "Fast. Cheap. Reliable. Pick Two." And the placement on the rear valance I think may be a nice distraction as other racers try to figure out what it means. Cayenne in Action. Desktop Quality Pic. This is the follow up email to last week pics. 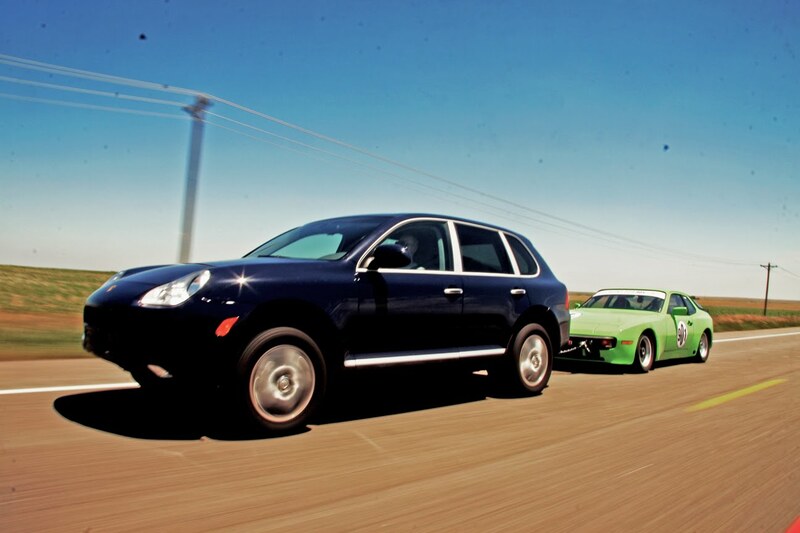 A friend of mine who drove his Focus SVT at the open track day grabbed this shot of the Cayenne towing, or is it 944 drafting, on the deserted HIghway 36. Deserted except for cops who make sure you don't speed on the way to the track. I do need to tell my friend to clean his lens though. Geez. Finally put all my stuff together and got the 'new old' race program hooked up and took her to the track. Pretty fun comparison shot. Wow! The Cayenne makes towing sooooooo much easier than the Wagoneer. The Waggy got the job done for sure, but it swayed and groaned around the road. Wagging more than Ulysses' dog. I believe I've lost some of my grassroots cred with this setup, but the 901 looks great. I have more pride of ownership of it now. And being 1" lower, it handled easier(not faster though) than last year. But ease of driving means more consistent lap times and better tire wear. Out of pocket additional expenses(those not covered by selling other cars and parts) to upgrade the tow car and paint the race car as well as get new tires and alignment and decals? Near as I can figure $1,000. No one is cheaper than a Connecticut Yankee. 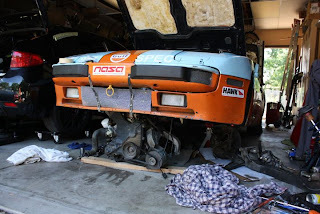 The last item on my list to get my SPEC 944 ready for a test day was to corner balance it. Ideally, I should have done this before I got my alignment, but the timing didn't work out. And I knew the car would be close to balanced as it was sitting level at 4 3/4 inches at all four corners as measured from the rockers. So, having borrowed some scales from 944 SPEC director locally, I set them up in my garage and got to work. The number I was really concerned about was my cross-weight. Now, I won't explain, but you can find out all about corner balancing here. Right from the get go, my cross-weight was 49.81%. Which is about perfect. But wait, I didn't check how level my garage floor was. Checking, it was 2 inches lower in the back than the front. Oops. After leveling the scales my cross weight was 48.1%. Not good enough. So, with some minor,(less than a quarter turn of my coil overs) on both front corners I was able to get the cross-weight to 49.51%. Ahh, good enough. The above chart is courtesy of here. My numbers are on the left. I was not about to try and get to their perfect numbers as it is a bit of waste of time. I mean fuel load, tire wear all effect the corner balancing. But, I am in the sweet spot and can't wait to get out on track. Most racing sanctioning bodies require that the cars on track have the fire extinguisher and the tow hooks clearly labeled. I could simply have ordered some decals up to add to the car, but since it was a long weekend I thought I would paint them on. Painted lettering on a racecar always classes it up a bit. So, I made the decals in photoshop, the less scrupulous could simply print them out, and then cut out the stencils. For the E, it was a simple one-piece stencil. For the tow arrows I made a background stencil in the shape of the arrow(black part), then a stencil for the word 'tow'. Simple. I used paint I had on hand or this would have been foolish to purchase paint for this. For a tacky glue, I used Elmer's spray adhesive as it is easily cleaned off but did a good enough job to stick down the paper. A couple of the lettering edges are not perfectly straight, but, that is what makes the proper.